Capture consent to standard terms with a single click. Manage acceptance of standard terms easily. Document and manage consent to clickwrap agreements—such as T&Cs, privacy policies and disclosures—while reducing expense, minimising legal risk, and improving customer experience. With Docusign Click, you can capture consent with a single click. Help ensure compliance and eliminate unnecessary legal risk with a complete audit trail. Customise display and acceptance options to meet your requirements. Streamline development and maintenance with auto-generated code snippets to embed in your website or apps. 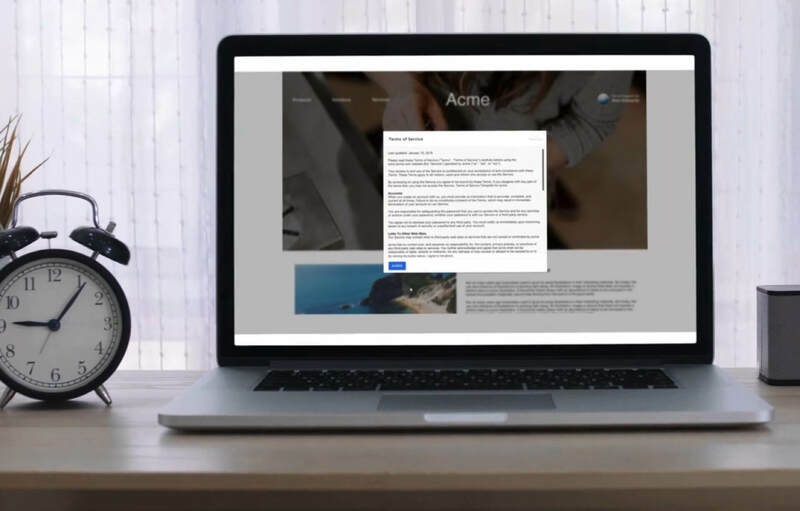 With quick setup, a secure and reliable platform, and a configurable, intuitive interface, DocuSign Click simplifies creating clickwrap agreements for customer acceptance in your website and apps. DocuSign Click is easy to use and simple to deploy. Configure agreement layout, enforcement, and recipient delivery. Generate code snippet and embed in desired customer site or apps. Maintain version control and manage clickwraps centrally. Or learn more about the legality of Clickwrap agreements in “The Effectiveness of Clickwrap for Legally Enforceable Agreements” white paper by DLA Piper. Other use cases include account sign-ups and openings, software licences and downloads, product trials, checkout pages, and registration pages. When would I use DocuSign Click versus DocuSign’s eSignature? 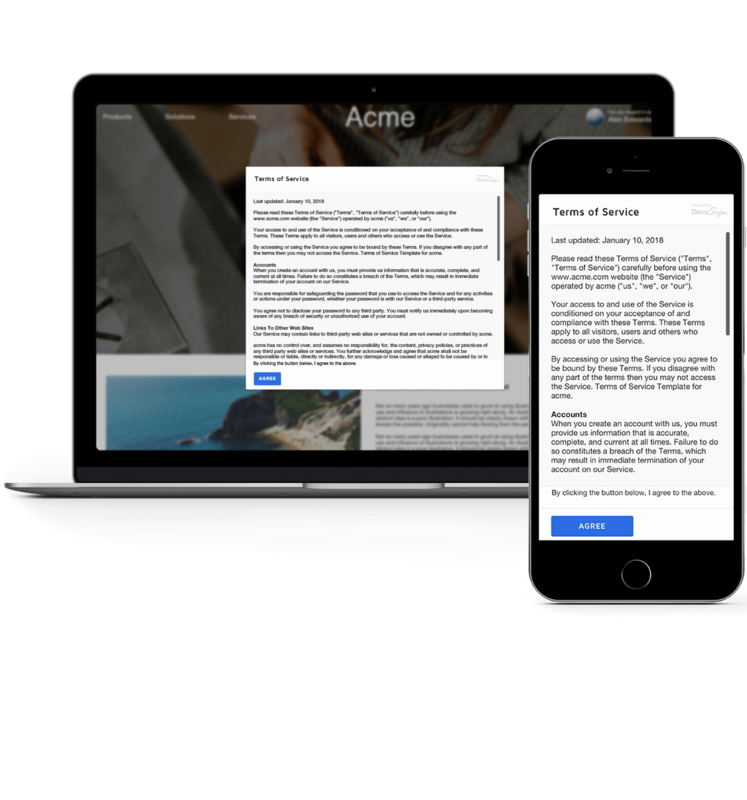 Click is designed for embedding high-volume, standardised clickwrap agreements (e.g., terms of service, T&Cs, privacy policies) into your website, portal, or apps. Your users will be prompted to agree or decline in order to continue. The signer provides no other information as part of the agreement, and there’s no way to add other signers or special routing. Whereas Click is for clickwraps, eSignature is for everything else: agreements that involve some combination of signatures, routing, active signer identification, and various other features that DocuSign eSignature offers. In which languages is DocuSign Click currently available? DocuSign Click is available in all the languages DocuSign supports today. Can I present a clickwrap in my customer website, portal, or application? Is DocuSign Click available via API? Yes, in addition to using the Click web application, you also have the option to implement and manage your clickwrap agreements with DocuSign’s Click REST API. It’s easy to use and simple to deploy. For more information, check out the Click API page on the DocuSign Developer Center. Can completed clickwrap agreements and events be posted back to systems of record like Salesforce? Yes. You can use a combination of the Click API and Connect to listen to status changes and post completed clickwrap agreements and events to systems of record like Salesforce.